The strangest thing I ate this week: what? huh? 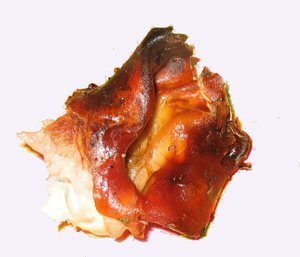 Crispy ear from a pig that so selflessly gave its life so that a bunch of friends could eat. OK, so it's not that strange. And it really wasn't this week. A few weeks ago, though. 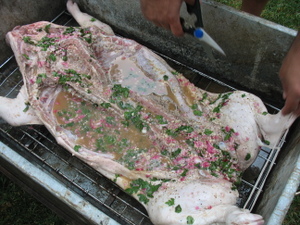 We cooked this pig in a homemade La Caja China (Chinese Box), Cuban style. 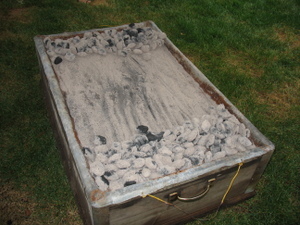 This method of cooking involves putting food in an aluminum-lined wood box, and putting coals on the lid of the box. This is pretty much the most fun you can have with a box and a bag of charcoal.